sally hansen color quick chrome pens - review and stamping swatches! Hey guys, I'm really excited to do this review for you today, because I'm really excited about this product! Sally Hansen Color Quick Pens, in six of the Chrome shades! I took about a million pictures of these and of the manicure I did with them, so see all that and the review after the jump! 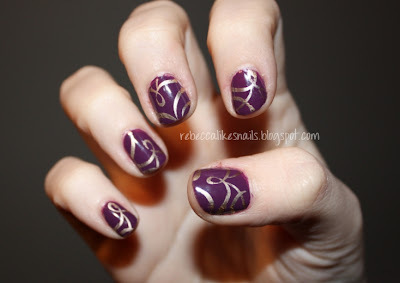 Hey guys, last Jewel FX accented mani for you today! I had to name this post Jamaica Me Crazy because I just love the name of this Essie polish. As I said, this is Essie's Jamaica Me Crazy, a lovely hot pink polish with lots and lots of microshimmer. It is so shimmery you would almost think it would be gritty, but it is smooth as glass. This was my first Essie and I'm happy that I got it! I really like it. And again, the stamping was done with China Glaze 2030, the image is from Konad m63. And obviously, Milani Jewel FX in Gold for the accent nail. Well, that's it for my Jewel FX accented nails. Which one was your favorite - Senorita Bonita, Frostbite, San Francisco, or Jamaica Me Crazy? Last night instead of doing homework I decided to use all my Color Quick Pens to do a mani and review. Hey guys, today I have for you another design that I did with my Jewel FX accent nail. I hadn't used this swirly image before but I really like how it looks! It's from Konad m63. The base color for this manicure is Sinful Colors San Francisco. My boyfriend bought me this for Christmas, and even picked it out himself! How sweet. I'm a big fan of this color. 3 coats. And of course, Milani Jewel FX in Gold for the accent nail! I dabbed a bit of 2030 onto the tip of my nail to cover where the glitter missed. You can't even notice that it is there, it just covers the bit of naked nail I was left with. I also received a wheel of bullion/steel beads from Born Pretty. I'll review these things in the coming days, when I have time between my projects and homework! Speaking of homework... I must go do some. Bleh! Hey guys, before I removed my intense Jewel FX gold nail, I tried out a few more designs with it. So today I have the first one for you! For this design I used China Glaze - Frostbite as a base, and I stamped from Konad m63 with China Glaze - 2030. For some reason, 2030 looked less gold over Frostbite than it should have. And of course, the accent nail is Milani Jewel FX in Gold. This is a more accurate photo of the colors! Out of the designs I tried, this one was my least favorite. I love houndstooth but it just didn't go so well! I've got a busy week coming up, so I probably won't have very detailed posts for the next little while. And then after this busy week? Exams. So I'm basically busy from now until April16th! Sorry in advance if I don't post as much as normal. I just realized, you can kinda see my reflection in the bottle... haha! Hey guys, I showed you a bottle picture of this polish a while ago, but never got around to swatching it. So in my day of sunny swatching madness, I did this one too! This is the last of the sunny holographic swatches. Blackout is a black jelly base with scattered holographic glitter, as well as silver glitter. The holo pieces can sometimes look a bit linear in the bottle, but not on the nail. The silver glitter is more noticeable on the nail. More pictures as well as a layering experiment after the jump! Hi guys, I have my last Milani 3D for you today. This one is called HD. HD is a silver holo, not quite linear but almost there. The glitter in this one is more fine than it's green and blue counterparts. More pictures and a video of it in action after the jump! So I did a little art on top! I haven't posted art in about a week, sorry for all the swatches! Believe me, this is not one to pass up. This design was loosely inspired by Ivana's similar combination. The base, of course, is China Glaze - Senorita Bonita from the yet-to-be-released Island Escape collection. I stamped with China Glaze - 2030 from Konad plate m57. This was my first time using this particular image and I really like it! On my ring finger I used Milani Jewel FX in Gold. That was no easy task. I did one thick coat, and then blobbed on more and using a toothpick I arranged it all so it fully covered. As you can see here, I didn't quite get it to my tip. This is less noticable in person. I can't wait to use this again and do it a little better! I had to do 2 coats of Seche Vite over this nail to get all the edges of the glitter covered! I am really digging this mani! How about you? Regarding all the swatching I've been doing this week, do you guys like swatch posts? I know I will always be more into art than swatches but swatches can be fun too! I still have one Milani 3D to post, plus a comparison! Look out for that tomorrow. Today I'm very excited to show you the polish I picked up from China Glaze's Island Escape collection. My Chatters had them out early! Only one really called to me and that was Senorita Bonita, the purple shade. But that's not what it looks like. This is as close to accurate as I could get it! My camera captured so many different shades it was unreal. More ridiculous pictures after the jump. Okay, today I have some insane holographic goodness for you. This is my first true linear holo and holy crap is it crazy. I wasn't expecting this to be so holo and blingy! The bottle is deceiving. Look! Light lime green chunky linear holo. Now I'm going to spam some pictures of all the holographic goodness. I have my other China Glaze Tronica polish to show you guys today. Gamer Glam is a light purple holo, but the holo is very subtle. More pictures, including sunlight ones, after the jump! Hey! Today I have a polish from the Tronica collection to show you. Unfortunately I could only get my hands on 2 out of the 5 or so that I wanted. And the ones I had ordered with Kayla Shevonne didn't get processed correctly before they sold out. So no more for me. Which makes me really sad, because after swatching this and the other one I have, I am in love! Now. I meant to do this post last week - but before I could post the pictures I took, I wore this one as a full mani and got a glimpse of it in the sun. After seeing it, I couldn't post pictures without sun pictures. I seriously did not expect to love this as much as I do. After the first swipe, I was hooked. No holo in the bottle. That changes on the nail. It's no Nfu-Oh or GOSH, but it's there! Wait until you see the sun pictures. I think some people would change their mind on these polishes not being holo if they saw this one in the sun. While shopping with my mom over the weekend I stumbled upon 2 of the Ocean colors from Sinful. I know Green Ocean is quite sought after, I'm not sure if these are. I swatched them both over black because they are very sheer. Blue Ocean - sheer blue base with blue glitter and blue-green flakes. Deep Red Ocean - sheer pink base with strange colored flakes and glitter - green, orange blue. No red or pink. Why isn't this called Pink Ocean? It's pink! It was hard to get the flakes to show really well but I think you get a good idea with these pictures. The flakes in Deep Red Ocean seem to be bigger, or I might just not have gotten big ones on my brush for the Blue Ocean swatch. Blue Ocean's base is a bit less sheer and gives a blue hue to the black while Deep Red Ocean's base doesn't change the black at all. I'm happy I found these! I can't wait to try layering them over other colors. I have an exam on Thursday as well as having an online discussion and French composition due the same day. I also have to somehow find time to get bloodwork done between school and work. No guarantees on posts every day this week. I really hope we get some sun between my classes tomorrow, I might be able to do a few quick holo swatches in between studying! Oh also, you may have noticed I've added some pages to the top of my blog. The most interesting being my wish list! I'm sure it is missing a lot but I think it is cute to have it there. I'm trying to decide what other things I could make pages for. Any ideas? Tada! I hope everyone likes the prizes. My giveaway is going to have one winner and one runner-up. See the details after the jump. I'm so excited! I've made it to 200 followers! I can't believe it, 200 in just over 2 months. Thank you to each and every one of my followers. I appreciate all of you! As I've been mentioning, I'm going to have a 200 follower giveaway! I still need to get it all together before I post it and open it, but just know that is is coming soon. 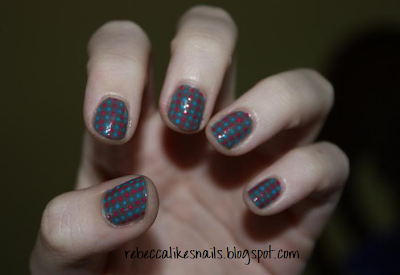 I have another cool layering polish to show you today!! Aren't I good at finding gems like this? I present to you, Sally Hansen Xtreme Wear in Lime Lights. This is nowhere near opaque on it's own. I got to 3 coats and stopped because it ain't happenin'. So I picked up a wheel that already had some good colors on it, added a few, and here it is! China Glaze For Audrey, Wet N Wild Black Creme, OPI Dim Sum Plum. Isn't this cool? Green shimmer! Over the lighter colors, it lets the color shine through, but then on black it just takes over and turns it into a cool dark green shimmer. It almost turns into blue shimmer over the blue shade, and enhances STWD with teal shimmer. I am in LOVE with it over Spontaneous. Purple with green shimmer! This will be my next mani. For sure. Also beautiful over For Audrey, the shimmer is so subtle it like it was meant to be there. Like I said, it just lights up over black and turns it into a cool green shimmer. And over Dim Sum Plum it is so cute too! I really like this shade. I'm really happy I picked this up. I like things like this that can enhance other colors or change up your regular polish just a bit. This color has been discontinued by Sally Hansen! But I might have gotten my hands on two bottles. Hey guys, second post today for a mini review of these dotting tools I got in the mail yesterday! I bought these on eBay, I paid around $2 for them, shipping included. Search "nail art dotting tools" and you'll find them from multiple sellers. First of all, they are super cute. There are 10 dotting ends, some of them are the same size, but no two tools are exactly alike. They are really sturdy, too! I don't know how they can sell these so cheap out of Hong Kong. I just don't get it. If you're a nail art pro or just getting started, I totally recommend these! They made a great addition to my nail art arsenal! I only went to one class today, so I did some swatching! I got 4 great polishes swatched and also did a few comparisons of polishes on a nail wheel. Look out for those posts in the next few days. 3 followers to go until I can hopefully start my giveaway! Depending how quickly I get those three, it might come a little later than 200 exactly. Haha! I'm almost out of all the pictures I've saved up to post. Guess I'll have to start doing my nails more often! The mani I have for you today was inspired by this cute Hello Kitty lunch box I have. I love Hello Kitty. A lot. I got this lunchbox at Old Navy. Isn't it adorable? Now for the nails! The pink didn't turn out as bright as I wanted, but still cute! Super simple. I did the dots with a toothpick. This is China Glaze Recycle, and the dots are Sally Hansen Xtreme Wear Blue Me Away! and a no-name pink from the dollar store. I think I need to do more Hello Kitty nails. With my HK plate. And better pink. I have a few things for my 200 follower giveaway coming up soon! 6 more followers to go! I have a reallllllly cool idea for one of the things I'm including. I'm really excited. But also stressed about what else to give away! I actually dreamed about it last night. Hahaha. In other news, I'm considering buying 6 Sally Hansen Chrome Pens on eBay for just $22. That's like $3.60 each which is a lot cheaper than the $7-something+tax that they are in stores. Furthermore, they don't have all the colors here. Oh lent. Why did I even kid myself that I could do it?! Today I've got an older mani to show you. I actually remember I was wearing this when I started this blog! Hahaha. Which, coincidentally, was 2 months ago today! 191 followers in 2 months. Thanks everyone!!! But I'm sure if I did it again, I would get better results. The base color is one of my favorites - Sally Hansen Complete Salon Manicure in Trouble Maker. I stamped from Konad m63 with China Glaze 2030. That's all for tonight - I'm going giveaway shopping! Last night when I was doing my nails I was planning on using/swatching an untried color. Buuuut then I changed my mind because these colors/this design popped into my head. Rhinestones, glitter, purple, bows... All my faves. All these stones are from eBay- purple stone from a 3mm wheel, purple triangle from a "mixed" wheel, mid-sized pearl from 3-size pearl wheel, and a clear rhinestone from a 1.5 mm wheel. This is my favorite stamping image out of all my plates! It's from Konad m59. I added a 3mm rhinestone to the center. I can see myself doing this design in a few more colors this spring!